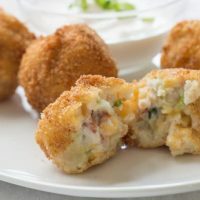 Everyone loves deep-fried appetizers and Loaded Mashed Potato Bites with bacon are no exception! 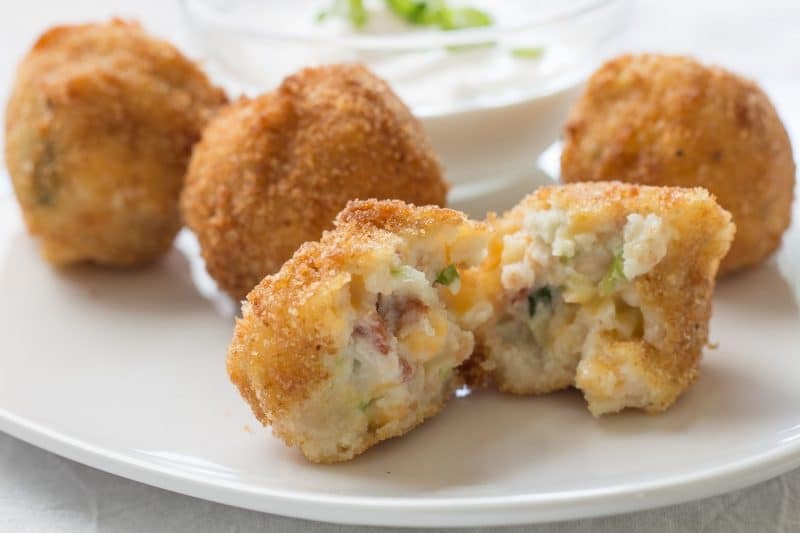 Deep Fried Loaded Mashed Potato Bites are little balls loaded with cheese, bacon, and green onions, then deep fried. Perfect for entertaining. 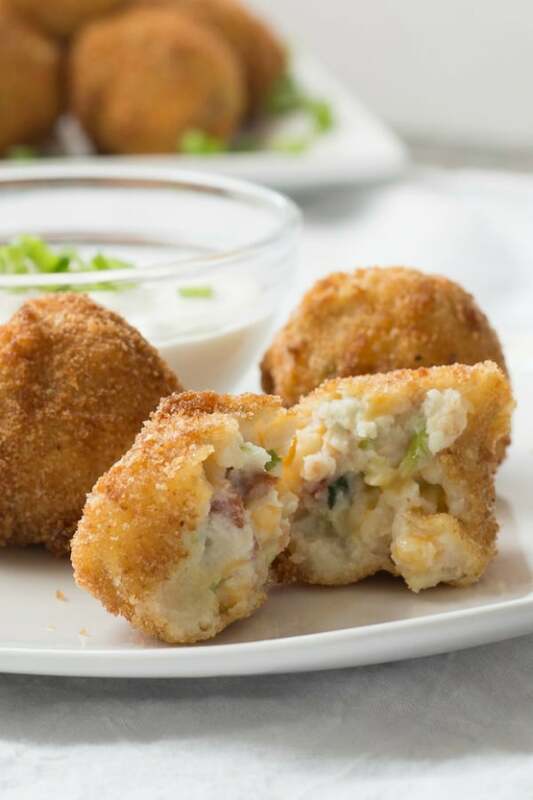 Loaded Mashed Potato Bites are a quick and easy appetizer. They would also be a great potato side dish to serve anywhere you might use french fries, tater tots, or mashed potato pancakes. This recipe was created using leftover mashed potatoes, but if your house looks like mine, there are rarely, if ever leftover mashed potatoes. I have been known to make these with the refrigerated mashed potatoes you can find at the grocery store. Instant mashed potatoes also work well. Just make them and let them set aside to cool for an hour or so. Most standard packages of instant mashed potatoes will make 2 cups of mashed potatoes. I used to make mashed potato pancakes but found that they tend to fall apart while frying if they oil is off just a hair in either direction. Loaded Mashed Potato bites don’t seem to be as fickle to me. You can use panko breadcrumbs if you prefer more crunch, I find panko provides a bit too much crunch for me in this recipe. Plain bread crumbs are my choice. Panko has its place in my kitchen, I use them for Fried Butterfly Shrimp. I also use the triple dip method, flour, eggs, then breadcrumbs. It seems to hold everything in place much better and there is less mess on my oil when things don’t explode while frying. The triple dip method also works best for Eggplant Parm, except we use 2 bowls here instead of 3. The breadcrumbs are mixed with the flour here. If you don’t like the triple dip method, you can try the 2 dip method with cornmeal like we use on our Deep Fried Pickles. The only requested change I have ever had with this recipe was to add more bacon. Really Larry? The best part about these little mashed potato balls is that you can add more of anything you want and leave out anything you don’t want! You can truly make these your own creation. Do not add any additional salt to this recipe, it has more than enough salt, to begin with, particularly if you are using extra bacon. The recipe directions call for putting your triple dip ingredients into a shallow bowl, I tend to use my wood salad bowls for this purpose. I use those salad bowls for food preparation far more than I use them for salad. Hahahaha! 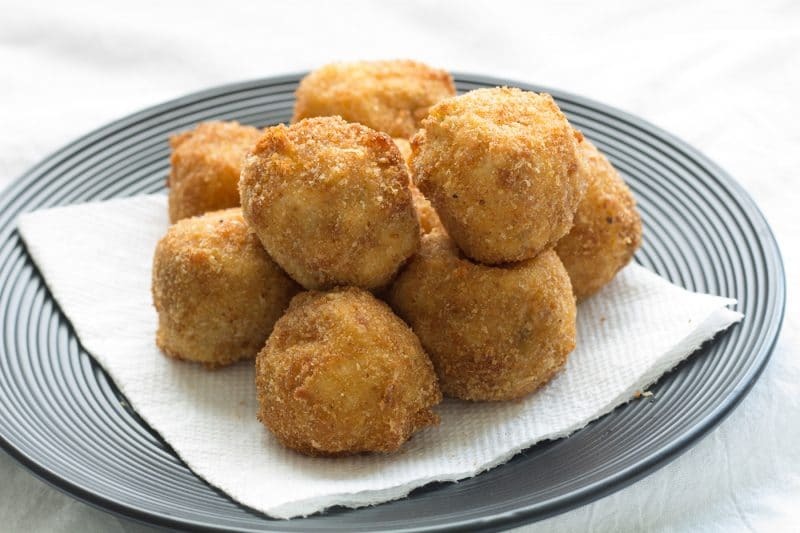 Mashed potato balls can be frozen before deep frying. Reduce the oil temperature a bit when cooking from a frozen state, the outside will brown sooner then the middle is warm and melted. They can also be frozen after frying. Place them on a cookie sheet or plate, not touching each other. Allow the potato bites to freeze solid before placing into a storage container. These can be reheated in a 350 Degree F oven. Test one after about 15 minutes, if the center is warm, the oven temperature can be increased to 400 Degrees F for a few minutes to crisp them up if necessary. If patience is not your strong suit, raises a hand, a quick zap in the microwave will work. Leftover Deep Fried Loaded Mashed Potato Bites can be stored in the refrigerator and be re-fried. Let them come to room temperature before frying again and watch them closer this time, as the coating will go from perfect to nearly burnt in a shorter amount of time. In a large bowl mix mashed potatoes, bacon pieces, cheddar cheese, and green onions. Place in refrigerator and allow to rest for at least 1 hour. Longer is fine. Prepare a plate for resting uncooked balls by sprinkling breadcrumbs on a large plate. Set aside. In a shallow bowl add flour. In a second shallow bowl add slightly beaten egg. In a third shallow bowl add the plain breadcrumbs. Using a cookie scoop, or two spoons, scoop some of the mixture into a ball shape. Roll the ball in flour and gently shake off excess flour. Place ball in eggs and roll to coat with egg. Allow excess egg to drip off. Hold ball gently to avoid smashing it. Place the ball into bread crumbs and roll to completely cover with crumbs. Place the ball onto breadcrumbs you placed onto the plate earlier. Continue repeating the steps above until all of the potato mixture has been turned into balls. Heat oil in a saucepan or deep fryer to 350 Degrees F on a thermometer, or until the end of a chopstick produces bubbles when inserted into the oil. 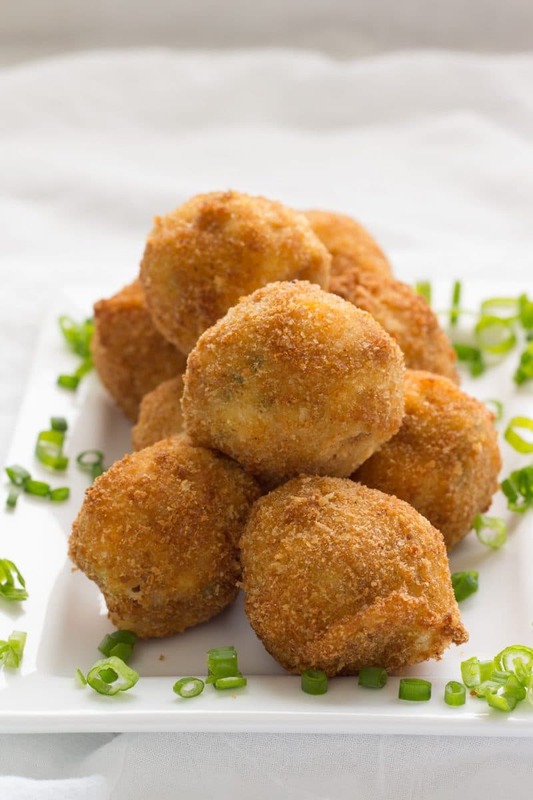 Drop mashed potato balls into the hot oil without crowding the pan, you will need some room to move them around without smashing them and breaking the seal you created with the triple dip. Fry until golden brown. 3 to 5 minutes. Remove from the oil and drain on paper towels or a cooling rack. Serve immediately with sour cream and/or ranch dressing. Leftovers may be refrigerated and quickly re-fried in hot oil or heated in a microwave for 15 to 30 seconds. Nutrition provided assumes 1/2 teaspoon bread crumbs, flour, egg and 1/8 teaspoon oil retained per potato bite. Calories provided from these items will vary greatly depending on how much of any one item is retained on the ball prior to and during frying and oil temperature.